Hello friends, this time I have got a special treat for you all. A couple of months ago, I wrote a blog piece for a wonderful Australian magazine called Dumbo Feather. I love this piece and for a while I’ve been thinking that I wanted to share it with you. Finally I have gotten around to doing so! For years I took my culture for granted. Growing up in Australia, I just assumed Kiribati would always be there, to happily welcome me whenever I decided to visit. But now I realise I don’t have that luxury. Kiribati, my cultural home, is disappearing before my very eyes. Four years ago, after spending a few years in London, I wanted a change of pace and to be with family again. So after a quick visit home to Australia, I boarded a smaller plane. Kiribati was what I needed. Auntie Bebe and her family met me at the airport and we began the drive to our family house; lagoon to the right, ocean to the left. There’s only one main road on the long, thin atoll of Tarawa and it runs the length of the island, like a lazy snake sleeping on top of the ocean. Kiribati life is squeezed between the road and the ocean. The car windscreen slapped through coconut tree fronds while cars and buses overtook us, beeping their horns to indicate. My uncle Nauni continually dodged around cyclists, pigs, buses and coconuts. We whizzed through villages: Bikenibeu, Eita, Banreaba, Teaorereke. I opened my window and began waving at every child along the road. They would wave back, enthusiastically calling “Imatung! Imatung! Imatung Mauri!” as our car roared past. 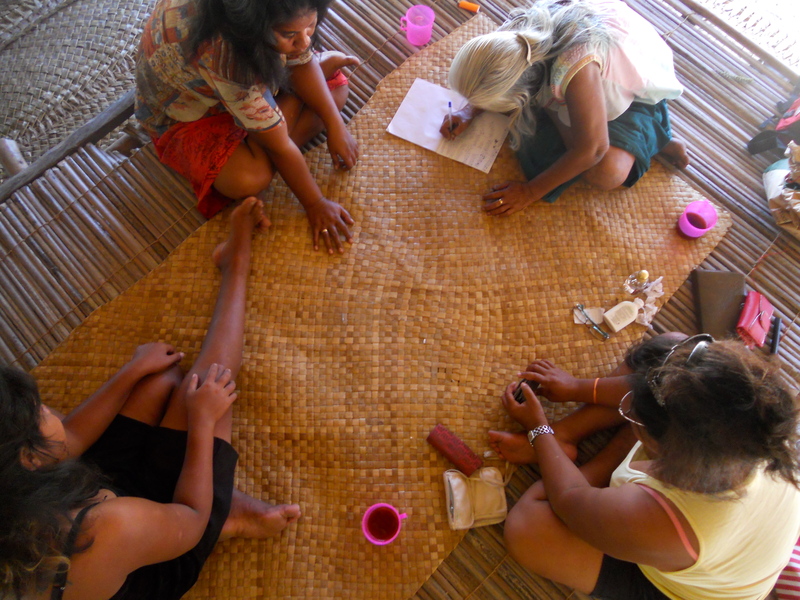 In Kiribati, both strangers and family call me Imatung. The white one. The half-­caste child. Finally we arrived home. Ocean-facing and a prime spot to watch the sunset over the Pacific, our family house stands defiantly on the edge of the country. I settled into local life pretty quickly: hand washing the laundry, picking up cousins from school, rubbing coconut oil into my grandma’s hands and picking nits out of the hair of any young relative who stopped by. Days were spent lighting fires to cook the daily supply of rice, gutting fish, learning to weave and nightly games of touch football with extended cousins. But there was one night that changed me forever. The night I realised that I had everything to fight for. That culture is worth fighting for. It was just another day in the household. All the young ones had fallen asleep and as usual, my Mum, Grandma, Bebe and I began our nightly game of cards. It was full moon and high tide that night. The ocean was roaring. All the windows were open in the house and the hot wind swirled around us, carrying our laughter and chatter with it. With the dealing of cards came conversation. We spoke of family politics, land ownership, family history and the problems our family—particularly the women—has had to overcome. I was like a babe in a new world, constantly asking questions of these three women. Something was different that night and we spoke of issues that are usually hidden in daily life. I knew that each of them wouldn’t bring up certain topics unless I asked and even when they answered, they would do so in whispers for fear that someone would hear. This was the night I discovered details about my grandfather’s ferocity. A proud, strong Kiribati man, Burabura had died in 1996, but the violence he put my grandmother and mother through still haunted them. My memory of him was that of a kind, strong grandpa who bought me sweets and my mother’s admiration for many of his positive traits is evident. But he was an I-­Kiribati man and unfortunately most men are taught to show violence to stake their position of “head of the family”. The stories were horrific but always followed with “But he was a good man. And we loved him. 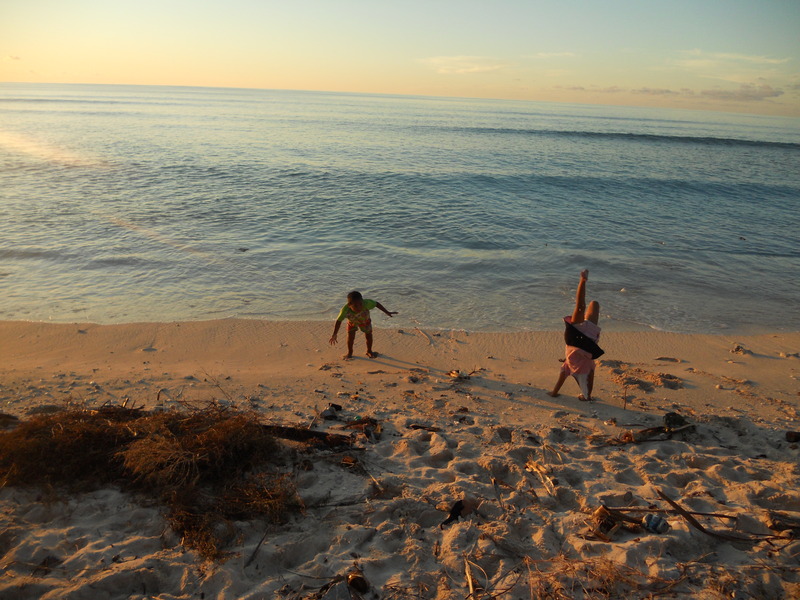 He was just doing what was normal at the time.” This is family life in Kiribati. The women speak about the violence in hushed tones, on the nights the ocean roars loud enough to cover their voices. I didn’t want to go to bed that night. Not only because I felt like I had been accepted into this secret society of amazing women, but also because I was too scared. The high tide ocean was ferocious and I couldn’t sleep because of it. I tried going to bed while the other three kept talking but I couldn’t sleep. When I had lain down, the waves were so loud that I thought that the ocean was going to surge in and drown me. Perhaps my imagination was running wild but with the waves smashing up against the sea wall that sat three metres from the house, I felt like I was drifting alone in the middle of the Pacific. I got back up again and lay on the mat next to my Grandma, waiting for high tide to pass. I still felt like I was drifting out in the middle of the ocean, but this time I was with the strongest women in my life. If I stayed with them, they would keep me safe. For generations, the Kiribati people have spoken of the ocean as their giver of life. They are proud fishermen, proudly depend on the coconut trees for food, water and shelter and respect the sea as if it were Mother Nature itself. The sea is their home. But now the conversation has changed. They no longer work with the ocean but they fight against it. The water has risen dramatically in the past 20 years and sea walls have been erected everywhere to stop the water inundating their well water and homes. Anywhere else in the world, it is a luxury to live by the sea. In Kiribati, it means that you are the first to be without a home. It was on this night that I realised that our family history could simply wash away. It wasn’t a global, climate change issue that I researched on the internet anymore. Climate change was now personal. This tiny patch of land in Teaorereke has been the only piece of land I’ve called home in Kiribati and it could disappear forever. I know I live in Australia and I have the privileged position to have another home to go to, but this land is my home just as much as anyone else in my family. 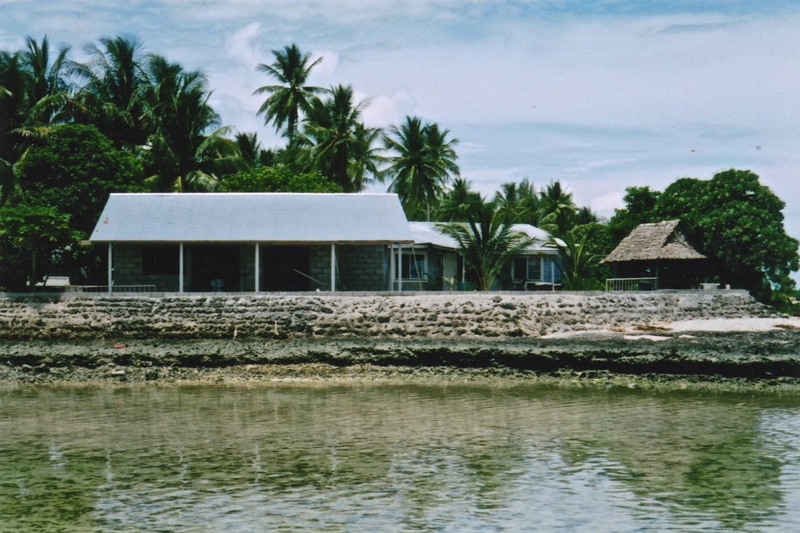 Like every other house in Kiribati, our house is predicted to wash away into the deep Pacific. It is such a big issue with so many complicated issues that it seems unbearable. Like trying to sleep in a room alone while the ocean threatens to swallow you up. But I can’t sleep soundly with this sound in my ears. This time it’s personal. I must get up and stay up with my family and share our stories. I won’t rest until the ocean does. Previous Post Changing the way we talk about climate change. Beautiful and haunting article Marita. I feel so embarrased that our government is giving so little attention to our pacific neighbours.